Some of us love road trips, while others absolutely loathe it. After all, isn’t getting from one place to another within the fastest time possible worth it, never mind that you have to cram it up with other economy class passengers? Regardless of whether your mode of transportation is by rail, sea, road or air, the $59.95 Swiveling Gel Cushion should be able to cater to everyone. Except for those who travel First Class or are chauffeured around in a Rolls-Royce, of course. 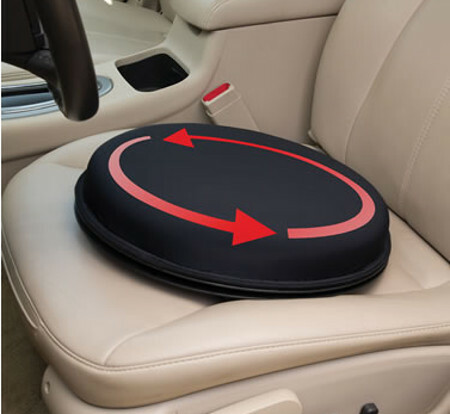 The Swiveling Gel Cushion happens to be the sole gel-padded cushion that swivels for easier maneuvering out of chairs and car seats. The cushion itself will rest on smooth-rolling steel bearings which will spin like a bar stool, so that users can effortlessly swivel their lower body when rising from a seated position. The cushion will arrive filled with 2″ of supportive visco elastic gel, and this gel assists to relieve pressure points so that comfort is enhanced during extended periods of sitting. It has a breathable polyester/spandex fabric cover that remains cool and can be wiped clean, while the sturdy plastic base delivers a textured, non-slip surface that anchors it in place. As long as you are no heavier than 300 lbs., the Swiveling Gel Cushion is worth checking out.